NETWORK FINALS: Both NBC and CW had baseball preemptions in some key markets, and suffered for it in final numbers: CAUGHT ON CAMERA and GRIMM were each down 0.1, and so were THE VAMPIRE DIARIES and THE ORIGINALS–the latter two particularly ugly post-adjustment at 0.3s. CABLE HIGHLIGHTS: ESPN’s afternoon coverage of THE MASTERS led Friday cable at 0.62. 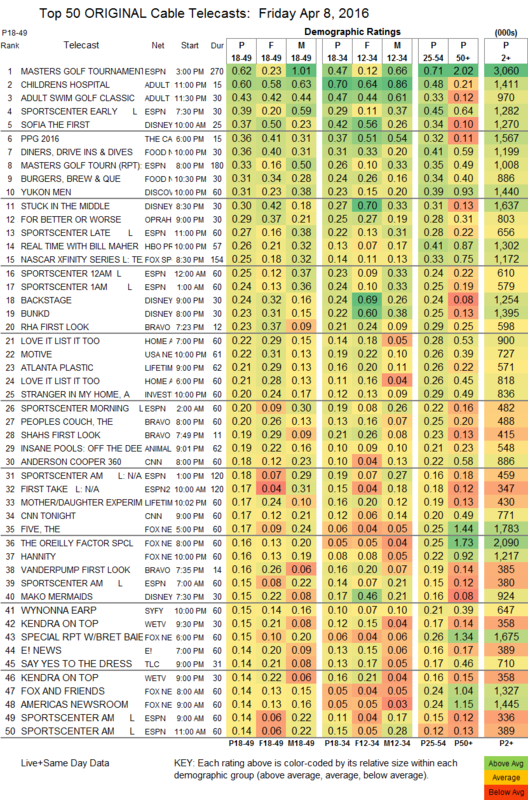 Adult Swim’s CHILDRENS HOSPITAL was up 0.09 to 0.60, followed by a ADULT SWIM GOLF CLASSIC special at 0.43. Disney Channel’s 10AM SOFIA THE FIRST hit the day’s Top 10 at 0.37 (in primetime STUCK IN THE MIDDLE was at 0.30, BACKSTAGE at 0.24 and BUNKD at 0.23), and Cartoon Network joined it with PPG 2016 at 0.36. On Food Network, DINERS, DRIVE-INS & DIVES was at 0.36, and the finale of BURGERS, BREW & QUE rose 0.05 to 0.31. Discovery’s YUKON MEN lost 0.04 to 0.31. OWN’s FOR BETTER OR WORSE ticked up to 0.29. On HBO, REAL TIME WITH BILL MAHER returned at 0.26, followed by VICE at 0.12 and the finale of ANIMALS at 0.05. USA’s MOTIVE gained 0.02 to 0.22. On Lifetime, ATLANTA PLASTIC dropped a heavy 0.17 to 0.21, and a 0.17 episode of MOTHER/DAUGHTER EXPERIMENT followed. Bravo’s THE PEOPLE’S COUCH climbed 0.03 to 0.20. 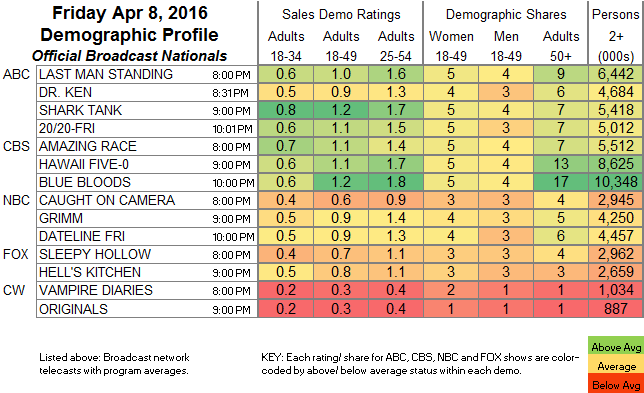 The 2d episode of Syfy’s WYNONA EARP dropped 0.05 to 0.15. On We, KENDRA ON TOP was at 0.15/0.14, after last week’s 0.18/0.16. Cinemax’s BANSHEE stayed at 0.10.